"Super Smash Bros" is undoubtedly one of the best selling franchises out there,But what about all the anime fans that have that same question of "who would win in a fight?". 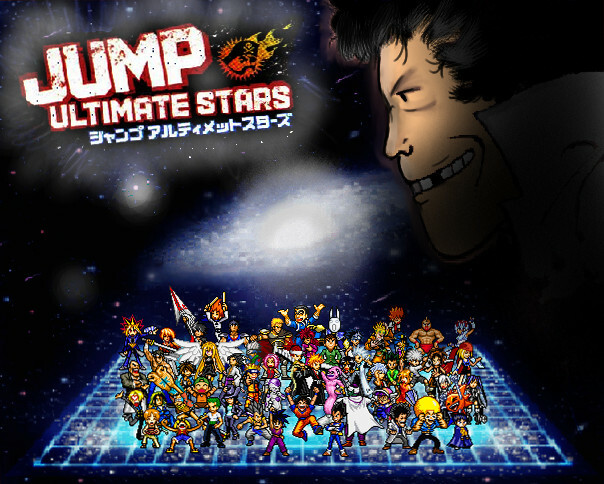 Well while there is not an absolute answer for you there is a hidden gem to make you say "thats more like it"It lies within the confines of the game entitled "Jump superstars" and its sequel "Jump Ultimate stars"these two games are packed with some of the biggest names in anime and manga to date. "Jump" is one of those Japan only Nintendo DS games that we in the US always hear about and then proceed to complain that we never get the good stuff. This is actually one of the times that i agree with not localizing the game. As much as a person in another country may say "oh i know about obscure anime x,y,z." theres like 100 or so people that may not even know that some of it existed and there are PLENTY of obscure anime characters in this game. Point being,it would not have sold well in other places. HOWEVER...This game is pretty good for a handheld fighter! It plays like "Smash Bros" but alot less technical. The roster of the game is pretty sweet to say the least.Like i said there are alot of characters that are lesser known as well as the fan favorites like Goku,Naruto,Ichigo,ect. It has its local multiplayer charm but also has an option to play online with others(at a smooth rate at that). It would have been great to see it come stateside or at least in English,but the best part is that it can be played on a US "Nintendo DS". So if you feel abit curious,import that ish yo! (shouldnt be alot of dollars either,its been out awhile.) I myself am looking forward to the next "Jump" game,because it might make the jump to a console or even the 3ds.